Teeth whitening is a quick and convenient way to brighten up the teeth for an overall more attractive and youthful-looking smile. It is relatively painless and can be repeated every so often to maintain the results. Zoom! 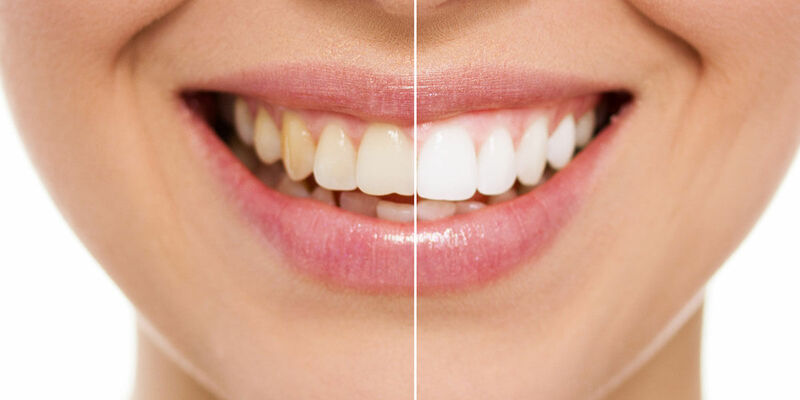 teeth whitening can lighten patients’ teeth by as much as 12 shades in one visit. Day White take-home whitening kits can be used in the comfort of the patient’s own home at their convenience. As individuals age, they may notice their smile loses its luster as the teeth become stained and yellowed by aging, smoking and the consumption of dark-colored food and drink. These patients are typically suitable candidates for teeth whitening with a Zoom! or Day White procedure. Before any cosmetic dentistry procedure, Champagne Smiles dentists thoroughly evaluate the patient to determine candidacy. Then, they explain the procedure and answer any questions. To begin a Zoom! whitening procedure, the Champagne Smiles dentists prepare the patient’s teeth and apply a whitening gel that is 35 percent hydrogen peroxide. Then, they administer sophisticated plasma-arc laser technology to activate the gel and enhance the bleaching results. This process may be repeated two to three times, depending on the patient’s initial condition. The entire procedure takes about one hour, and the results can be maintained with take-home Zoom! touch-up kits, which the dentists customize for their patients. With Day White teeth whitening, patients can revitalize their smiles in 30 minutes, twice a day. Day White teeth whitening kits contain a 7.5 to 9.5 percent hydrogen peroxide whitening gel, as well as other ingredients to reduce gum and tooth sensitivity. Champagne Smiles offers the single-use, mini, starter, standard and deluxe Day White kits, as well as personalized mouth trays for a comfortable fit. Patients who receive take-home whitening kits are given complimentary refills every six months, as long as they maintain regular dental check-ups. After undergoing teeth whitening at Champagne Smiles, patients may experience tooth sensitivity for a few days. Our dentists advise against eating or drinking anything that is extremely hot or cold until the sensitivity subsides.